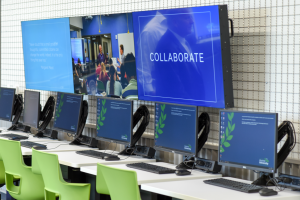 AURORA, Ill. — Local school officials, donors, high school students, and representatives from corporate and philanthropic partners gathered on campus July 27 to witness the dedication of the new Michael J. Birck Collaboration Center for Innovation at Aurora University. The Michael J. Birck Collaboration Center for Innovation at Aurora University features 3,200 square feet of flexible classroom and lab space. The Collaboration Center for Innovation houses the Michael J. Birck Engineering Program, which extends STEM learning to area high school students. Both are named in honor of Michael J. Birck, founder, CEO and chairman of Tellabs Inc. Birck died in 2015. The Tellabs Foundation provided $1 million to help finance the new facilities and the program itself. The center is a testament to the power of collaboration between the university, businesses and philanthropic organizations in promoting STEM education, according to AU President Rebecca L. Sherrick. “When I came to Aurora University 18 years ago, who could have foreseen what is happening here today and the impact it would have on the city, region and the state?” she asked. The center is located in renovated space within Stephens Hall adjacent to the John C. Dunham STEM Partnership School. The STEM Partnership School opened in 2014 to provide instruction in science, technology, engineering and mathematics to 200 third- through eighth-graders from four local school districts. The Michael J. Birck Collaboration Center for Innovation features 3,200 square feet of flexible classroom and lab space, as well as a garage and “maker space” complete with high-powered computers, 3-D printing and scanning technology, laser cutting tools and other equipment that students use to design, prototype and perfect their own inventions. The program gives high school students the opportunity to work directly with local technology and engineering professionals. 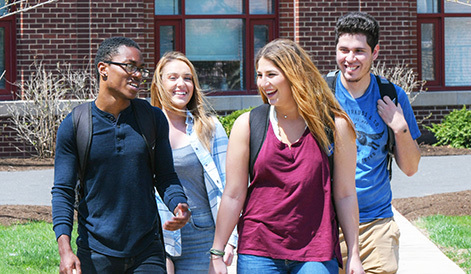 Students receive two undergraduate credits for each course they successfully complete. Through hands-on, “real-world” projects, students learn concepts and processes that are common in current design and engineering practice, and develop the interpersonal and communication skills that are required in today’s business world. Students also build an awareness of ethical business practices and learn about a wide variety of career opportunities available in STEM-related fields. Partners include Cabot Microelectronics, Caterpillar Inc., Cordogan Clark & Associates, Fermilab, Fox Valley Park District, Magnetrol International and Southern Company Gas/NICOR.